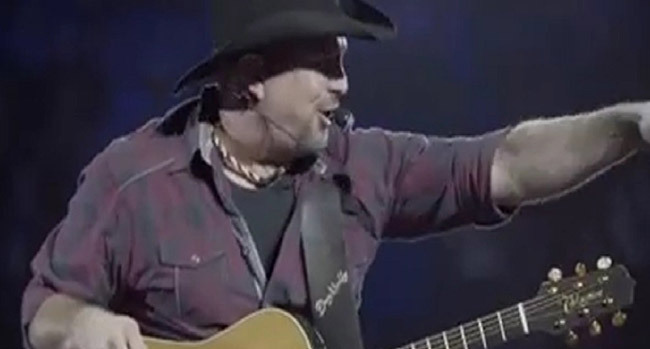 Garth Brooks has sold out two out of two stadium dates for next spring. Only two shows have gone on sale so far on The Garth Brooks Stadium Tour, and all tickets are gone for both concerts. Brooks sold out the first date of St. Louis on March 9th within hours of going on sale, but has now also sold out his Glendale, AZ stop on March 23rd. Brooks has two more stadiums on sale this week. On Thursday, University of Florida’s Ben Hill Griffin Stadium in Gainesville, FL, goes on sale at 10 am EST. The concert will be Saturday, April 20th at 7 pm. On Friday, Heinz Field in Pittsburgh, PA goes on sale at 10 am EST. That concert will be Saturday, May 18th at 7 pm. For both shows, tickets can only be purchased at ticketmaster.com/garthbrooks or either Ticketmaster Express 1-866-448-7849 or 1-800-745-3000. These shows are the first of a new three year North American run of stadium dates. The tour will hit 10-12 cities per year for three years playing at college and professional football stadiums. Recently, Brooks sold out the first ever concert at Notre Dame Football Stadium. The concert, Garth: Live at Notre Dame! was filmed for television and will air on CBS on Sunday, December 2nd at 8 pm ET/PT. The tour is set to hit Notre Dame Stadium again something later during the trek. Brooks’ The Anthology Part III, LIVE, was released last week. It’s an exciting, detailed, insider look at the electrifying concerts of Garth Brooks, with behind-the-scenes stories, insider secrets, and interviews with band and crew. It contains five CDs with 52 live recordings, never before seen photographs and ten augmented reality experiences that can be seen on the Garth Live app. It also includes the new live album, Triple Live. It’s the soundtrack of the record breaking, number one tour in North American history.